To stay at the forefront of aircraft engine component design and manufacturing, the CNC machines used must perform to the highest standards. At Pilsen, we’ve worked alongside manufacturers in the aerospace industry for over 25 years. 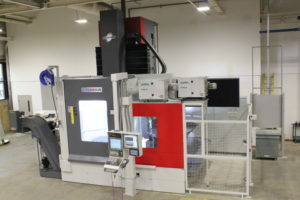 We understand that choosing the right equipment is a critical decision, and partnering with a machinery provider who has the expertise to deploy and support large and specialized machining solutions is even more important. Whether your applications involves vertical turning, horizontal boring, or 5-axis machining capabilities, Pilsen offers a wide range of equipment and capacities that are ideal for machining jet engine components with multifaceted geometries and tight tolerances. Jet engine assemblies require complex structural parts of various sizes, often made of temperature resistant and lightweight materials. This takes specialized machinery that can maintain high forces with high accuracy over extended travels and large work envelopes . . . the kind of equipment that Pilsen delivers with unsurpassed installation and support experience. 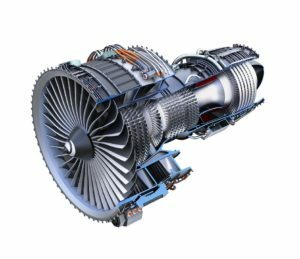 Cross section of turbofan jet engine isolated on white background. 3D rendering image with clipping path. Few industries require the accuracy, repeatability and resilience of aerospace manufacturing. At Pilsen, we often work with extremely tight tolerances and the stringent quality specs that aerospace manufacturers face. That’s why we provide customized, high-performance machining solutions from the world’s leading builders of 5-axis, vertical turning and boring machines. Our team works directly with machine builders and 3rd-party vendors to deliver the most accurate and productive solutions available for your application. This includes a range of automation capabilities, such as tool and pallet changers to optimize in-cut times and increase machining throughput . . . all while maintaining the highest levels of accuracy and quality. Our REIDEN 5-axis machining centers are ideal for cutting complex aerospace part geometries with the fewest operations, including high-speed machining of a broad range of materials. Pilsen has the right machining solution for your aerospace application. Please use the online request form below to tell us about your machining requirements.